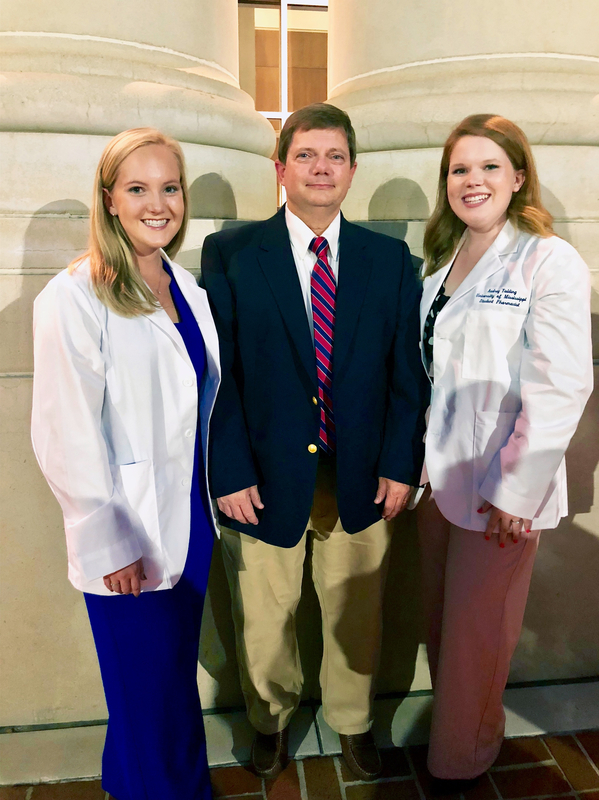 Lauren Yielding Black (left) and cousin Audrey Yielding, both first-year student pharmacists, attend the 2018 White Coat Ceremony with Frank Yielding, a 1992 graduate of the School of Pharmacy, who is Lauren’s father and Audrey’s uncle. Frank is the perfect candidate for the duo to learn from. His fascination with the profession began early when he was drawn to the atmosphere of his local pharmacy, Fulton Drug, in Fulton, Mississippi. After gaining experience behind the counter with pharmacist Dan McElroy, Frank followed in his mother’s footsteps and attended Ole Miss. Raising his family in Fulton, Frank has spent the last 24 years as the pharmacy manager at Walmart and is now the one passing knowledge to younger generations. “As a child, I never understood exactly what he did,” Audrey, a native of Tremont, Mississippi, said. “I knew that he was highly respected in the community and that he was the person we went to when we had questions about medications. David D. Allen, dean of the School of Pharmacy, said the Yieldings’ story was representative of the pharmacy school’s emphasis on the importance of family. “We welcome them from their family into our Ole Miss Pharmacy ‘phamily,’’’ Allen said. When it came time to choose a school, Lauren and Audrey didn’t have to look far; Ole Miss was their top choice. As the Yielding family tradition continues, Frank is eager to watch the pair impact pharmacy in their own ways.